Chevrolet’s Camaro has been catching the eyes of many generations since it hit the streets in 1966, due to its sporty look, head turning rumble and performance driven engineering. Now, almost 50 years later, Chevrolet is releasing its 2014 model of the Camaro. While the new model will remain similar to the batch of fifth-generation Camaros—starting in 2009—the 2014 model has been slightly redesigned for more attractive and purposeful qualities. So, for all you diehard Camaro fans out there, let’s see what’s in store for the 2014 SS model and the extra steps taken for the re-released Z/28 model, which will be available later this year. Because the 2014 Camaro is equipped with Recaro® Performance Sport Seats, you’ll enjoy the height of sport-car luxury. These seats take their cues from what you’d find in the front seat of racecars, so you’ll experience comfort, excellent (and adjustable) lumbar support, and contours to keep you in place during any aggressive driving situations. The exterior of next year’s model was designed with the race track in mind. The front fascia has been angled and enlarged to give a wider appearance and to improve the cooling system while also considerably reducing drag. 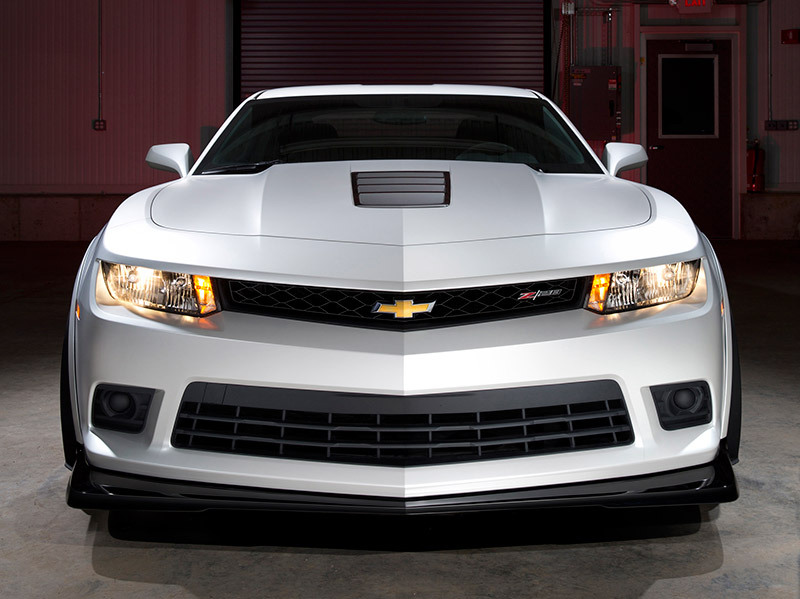 The fascia’s front grille works in tandem with the hood vent to reduce drag for increased stability at higher speeds. The rear end was also re-thought in order to improve on the Camaro’s already great aerodynamics. While the SS model is already a powerful beast among the pack, Chevrolet is releasing a new Z/28 model that completely obliterates any competitors. Equipped with many of the same features as the standard model, this race-specific version takes extra leaps and bounds to provide the kind of performance drivers look for as they seek the winner’s circle. This model, geared for track perfection, is queued up with the 7.0-liter, naturally aspirating, LS7 V8 engine, fulfilling any thrill seeker’s need for speed with 500 horsepower. Along with the top-notch exterior design and engine, the Z/28 is installed with differential transmission and brake coolers, which allow for a longer and safer engine performance. The track perfecting doesn’t stop there; this speed demon’s delight was made as light as possible by installing a thinner rear-window, making air-conditioning optional, removing all but one speaker (so you can hear the “ding” of the seatbelt reminder) and removing trunk carpet and insullation. Aside from being built for the track, this version is also a top choice for those seeking 500 horsepower of street-legal power. View local Camaro inventory here! With the redesign, the 2014 Camaro is looking pretty good. Are you hoping to snap up one of them for yourself? Is this enough to inspire similar performance leaps from Ford? Posted in American Made, Camaro, Chevrolet, Industry, Racing and tagged 2014 Camaro, Automotive, performance, Racing, Z/28. I have been a Ford Girl from a Ford family even married a Ford man…but…I’ve got to say, I am in LOVE with this car!!! I have owned the 95 Mustang 5.0 5speed convertible, much wanted car, and so enjoyed driving it. The power, handling and all around working of it made it a beast. I bought a 2004 F250 off the floor and it is a workhorse still going strong with less than 90,000 miles. But one day….I WILL own this 2014 Camaro Z28… Ford be damned!! !